If you haven’t noticed, there are an awful lot of couples around the South making and selling amazing stuff for your home and kitchen. You may have even seen a few examples here at Southern Kitchen. 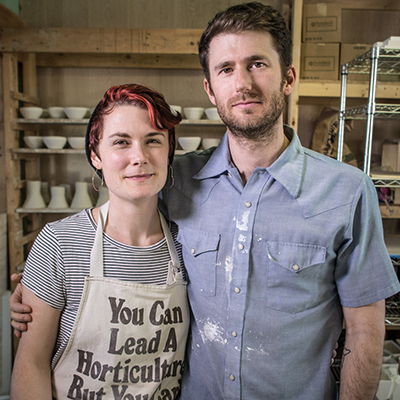 Now meet Jessie Bean and Anderson Bailey of Chattanooga, Tennessee: a married duo of creatives who hand-craft beautiful pottery at Bean & Bailey Ceramics, and whose lovable quirkiness is applied to the promotion of their products as well as the creation. 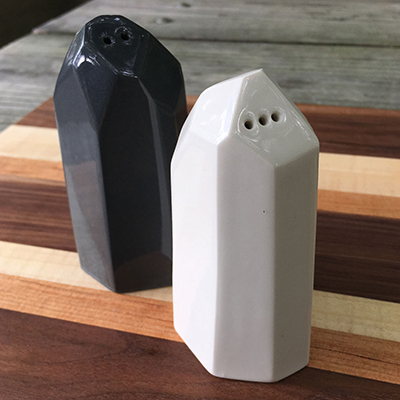 With soft, eye-appeasing designs that range from asymmetrical nesting bowls to geometrical salt and pepper shakers that resemble pieces of crystal, Bean & Bailey has built a devoted following around the Southeast. 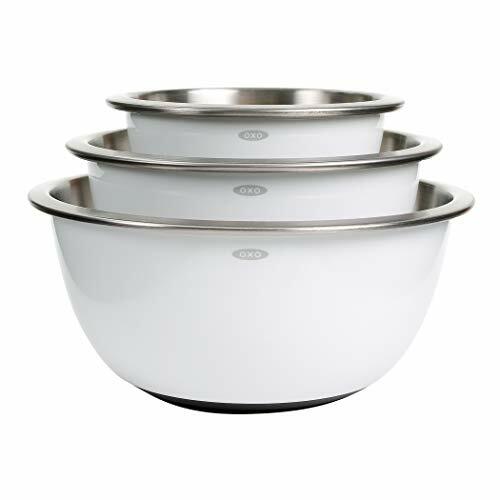 Not only are their wares feast-worthy to the eyes but they are wholly functional and practically beg to be brought out for guests. Before they were producing small-batch, one-of-a-kind porcelain by hand, in their small studio located in Chattanooga’s Highland Park neighborhood, Jessie Bean and Anderson Bailey were friends who happened to meet at Tennessee Tech University’s Appalachian Center for Craft, part of the school’s nationally accredited School of Art, Craft & Design. The two students bonded through conversations behind the Center’s clay studio and became classroom partners in glass-blowing as they gained respect for each other’s talents and gravitated toward each other’s personalities. They married and took their talents on the road, with Anderson spending the better part of a decade studying under and working for artists in Portland, Oregon, and New Mexico, before they resettled in the Chattanooga area. Anderson began making pottery to sell at craft fairs until he realized he wanted a lifestyle that was more sustainable. 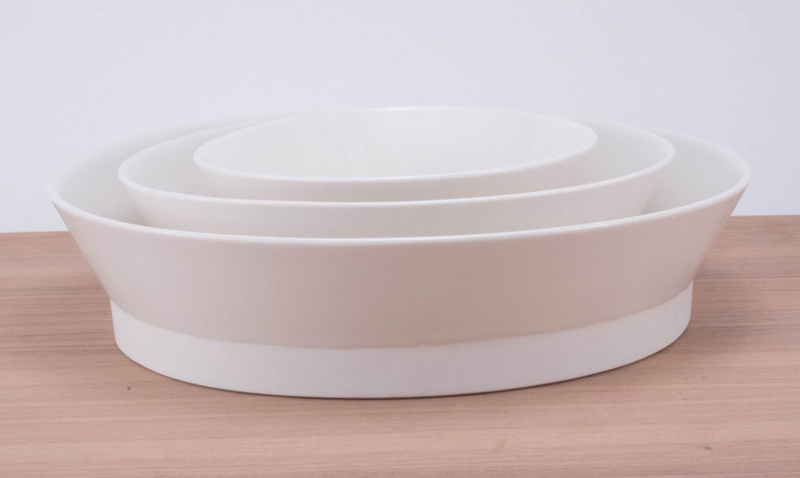 The timing was perfect, as Jessie, who was already an expert designer and glassworker, was becoming interested in slip-casting ceramic pottery around the same time as Anderson was invited to a slip-casting workshop at North Carolina’s Penland School of Crafts. When they realized the benefits of slip-casting as opposed to using a pottery wheel for everything they made, the vision for Bean & Bailey began to take form on its own. Since slip-casting involved creating a mold in which “slip” (liquid clay) could form into a specific shape, it presented the couple with an easier and more cost-effective way to mass-produce designs, and gave them the opportunity to come up with scalable plans for a business. Already having the talent, expertise and space to turn their talents into a business, Jessie and Anderson then applied for a grant with MakeWork. A now-defunct initiative of a nonprofit Chattanooga-based program called CreateHere, which offered financial incentives to creatives willing to move into town and start businesses, MakeWork would eventually give out more than $1 million dollars before ending, and Bean & Bailey Ceramics were among the 101 recipients of funding and mortgage forgiving incentives. 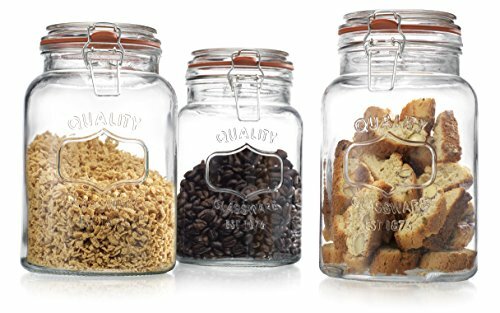 Today the Baileys offer an impressive catalog of products, from tabletop birdie flower pots to hanging planters, tumblers, vases and more. The bulk method by which they form these and other ceramic household items (coffee mugs, cocktail cups, etc.) still allows them to hand-make their products. And the craftiness of their asymmetrical, multi-faceted designs is an instant giveaway to the fact that the unique couple is still using their common love of creativity to create things that work. Oh, and they're having fun doing it. Just have a look at the self-produced promotional videos on Bean & Bailey’s Instagram account for further proof of their lovable zaniness.